Hello All my fellow bloggers, readers and wedding planners! I am back! Oh boy, have I missed this. After calling off my engagement back in May 2012 I didn’t think I would come back to this blog for a very long time – if ever; but lucky lil me is engaged again! I met my fiance through work and he helped me to discover me again; and it became so obvious why my previous relationship didn’t work out. We moved in together (with family) in January 2013, and then moved in to our own place in March 2014. 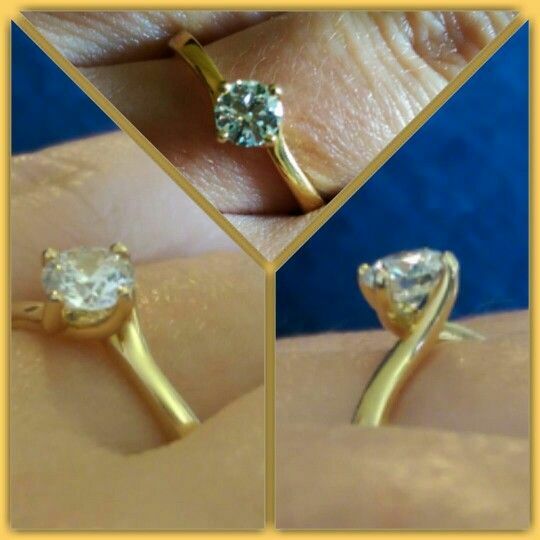 I was simply enjoying being in the new relationship, when we went on holiday in October 2014 and he proposed. Now, my fiance is not the romantic type, he really isn’t. He doesn’t buy me flowers, or tell me how special how I am, or whatever else the Mr Darcy’s of this world do, but he is solid, dependable, he protects me and he shows me how much he loves me through small every day gestures. Our first valentines went by without him buying me anything, not even a card, but he did take me out for dinner the weekend after. I’ve put the little description of my fiance’s romantic downfalls so that you can picture how romantic the proposal was…for him…and for us. The first full day of our holiday in Cyprus, we had dinner in our hotel and then he suggested going for a walk along the beach. The sun had set, and there was a slight breeze moving out across the beach. We found the route from the hotels restaurant down to the beach and took our shoes off so we could paddle our feet in the surprisingly warm water licking its way up the beach. After a little while of walking hand in hand he disappeared away from me, but I was still running in to the water and then running away as the tide chased my feet when he called over to me. He was knelt on one knee in the sand scratching his leg. As the dutiful girlfriend I stepped towards him to check his leg for any offending reason for the itch. As I informed him I couldn’t see anything to cause an itch he produced from behind his leg a box. His words were short and sweet, a simple “I love you, will you marry me?” and he opened the box to reveal a ring I couldn’t have chose better myself. After accepting, and crying a little, we walked back along the beach hand in hand to the restaurant bar where we ordered…ha! not champagne! no! just a bottle of nice wine and told some people we had already met that we were engaged! The ring however was four sizes too big (learnt how big it was upon arriving back form holiday and going to the jewelers to get it re-sized), so sadly I couldn’t wear the ring until a week after we came back from our holiday. Originally the plan was to have a short engagement and to get married October 2015 (1 year after getting engaged), however, after doing our wedding spreadsheet we decided we needed long to save; therefore the date is set for Saturday 8th October 2016. 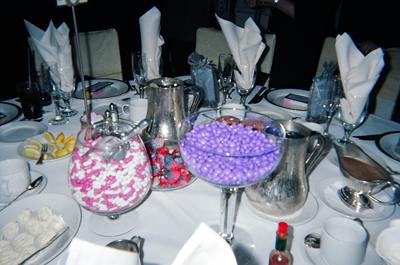 The wedding costs spreadsheet will be in my next post. 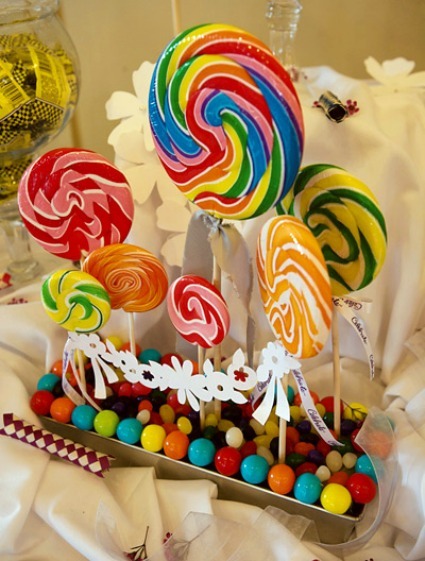 What came after the amazing fork pom pom! The Worlds Best MOH sped through making the pom poms once we mastered the fork technique; so much so that we had a very productive production line. 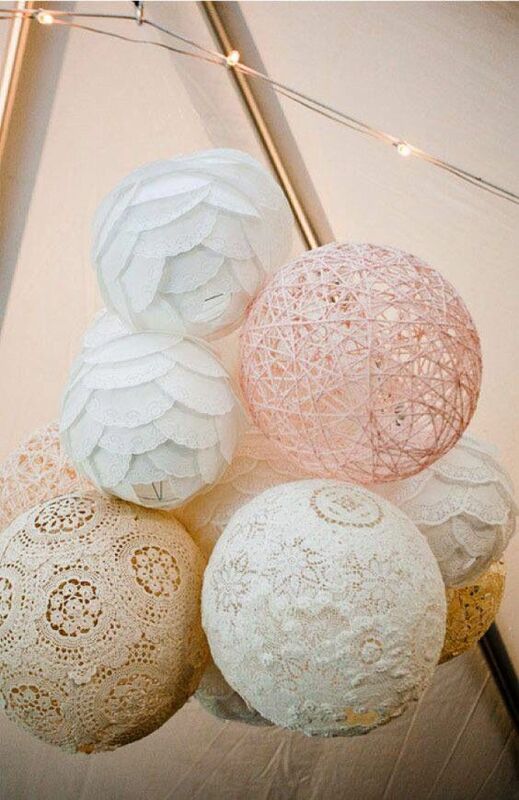 At times I thought I wasn’t going to be able to keep up with my job of cutting the hoops and tidying the pom poms up. 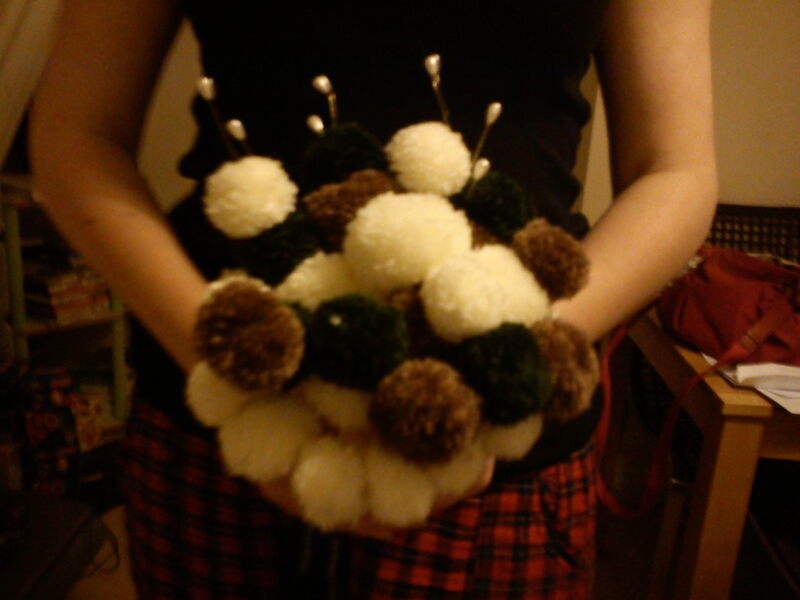 Once we had used up all the wool I had making as many pom poms as we possibly could it was time to actually get making the button holes, bridal bouquet and wrist corsage’s. One moment I was tidying some pom poms while watching an apparently tear-wrenching film, the next minute The Best MOH EVER was holding up towards me a wonderful button-hole. The film did not make me cry, but the button-hole did. I was so happy! I knew what I wanted to achieve but as someone who has less creativity than an armless gibbon I was sceptical that I would be able to achieve what I wanted to. But there in front of my eyes was the vision coming to life. It needed a few tweaks and finishing touches but she had done it! Just by having a little play around with the items we had in front of us. All we had to do was wrap the stem in ribbon and make 4 more. It felt like a big achievement to have just got the buttonholes done! We, however, had a lot more to do. 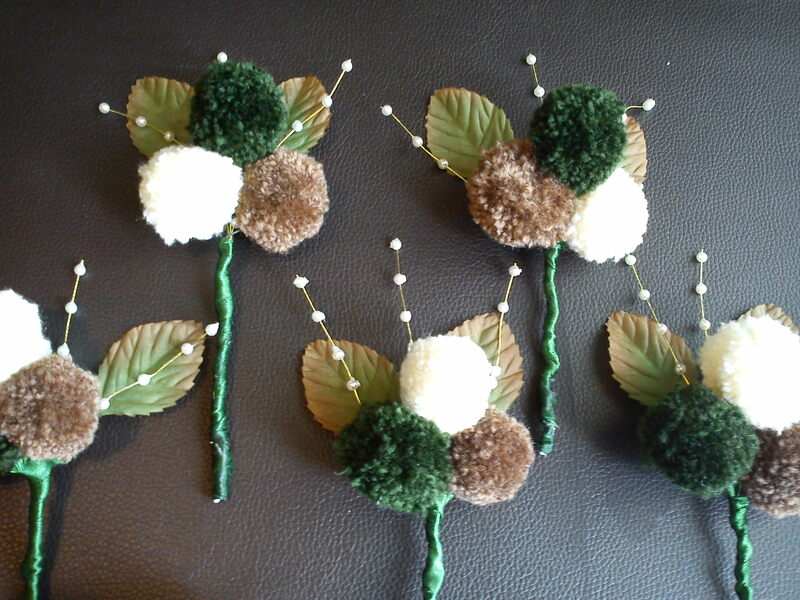 The buttonholes were done – aka the easy part was over. Now it was on to the bouquet, which was deemed by us to be the next easiest thing. OK, so it isn’t quite finished in this photo, it looks a bit dark and look like it is definately lacking something… but we have the basic idea. I wanted to add some feathers to it, and I wanted to add more of the pearls that you can see at the back to the bouquet to add more character to it. 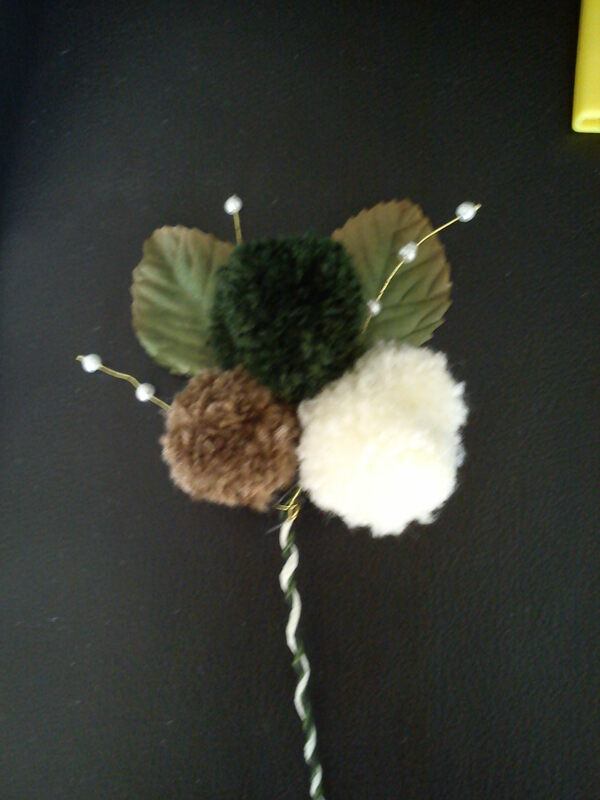 The buttonholes and the bouquet were done on Saturday (it now being Sunday afternoon). The MOH and I didn’t finish until late on Saturday night. At about 10.30pm we decided to call it a night. We sat and watched a film with a glass of wine admiring our work. Sunday morning saw my maid of honour wake up early as she always does to another day of wedding crafts. I had the belief that the wrist corsgae’s were going to be the hardest thing to make. 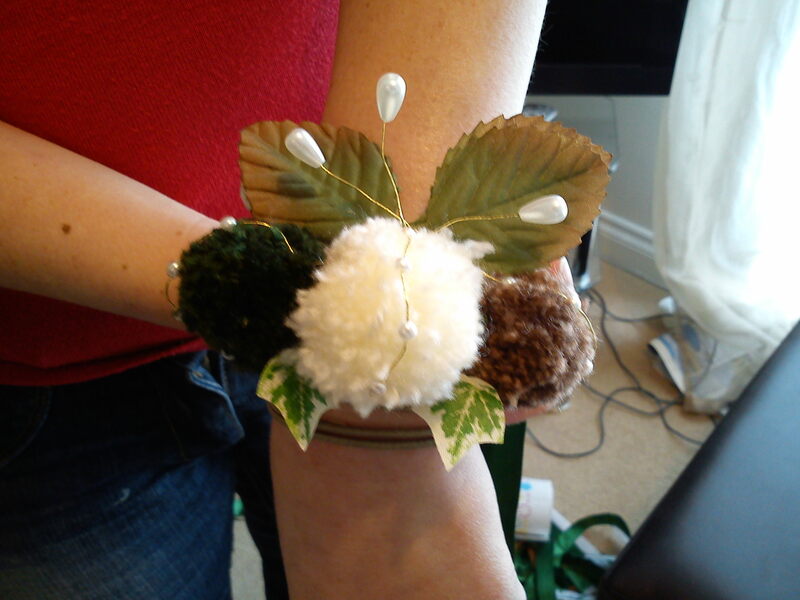 Mainly because there are many people on the internet showing step by step guides on how to make a bouquet or a button-hole, but there aren’t many web pages dedicated to wrist corsage’s out there, especially not non flower wrist corsage’s. The un-known entity of what we were about to try and make was daunting but we were also determined. I will be honest, the process was long and difficult. We didn’t agree on how to do it like we did with the bouquet and BH’s, and our communication broke down a little bit which did not help. In the end we got there and this was the result of all our hard work. I will write-up a bit more instruction about how we made each thing and post more pictures of everything soon. It wasn’t an option for me, I knew that I would be looking to the high street for many things for my wedding. The first thing I bought on the high street was my bridesmaid dresses. I saw them in the sale, reduced by 50% to £50 and knew that I had to have them. I sent the link to my Maid of Honor (here after known as MOH) who also liked the dress. My MOH was a complete star with the bridesmaids dresses, and if it wasn’t for her there is no way I would have been able to get them at that price. She phoned round the stores hunting down the right sizes as there wasn’t many of them left by the time I saw them on the website. We did have some issues with getting them, but thanks to my MOH we got them and they looked great! The shop where I got them from? Debenhams! For me, I wanted the bridesmaids dresses to be something my bridesmaids could wear again and most important were comfortable wearing. The dress had also really good reviews online and seemed perfect for the autumnal wedding we were planning. when the dresses arrived my MOH tried hers on and she loved hers. The one we got for my BM was too big, but have kept it, as the dress hasn’t gone back in the sale down to £50 again yet. When it does I will get the smaller size she needs and sell the bigger one. I got my day wedding invites for FREE 😀 from a couple who had got married and had loads of invites left over, so just had to buy my evening invites, which came from a high street discount card shop. 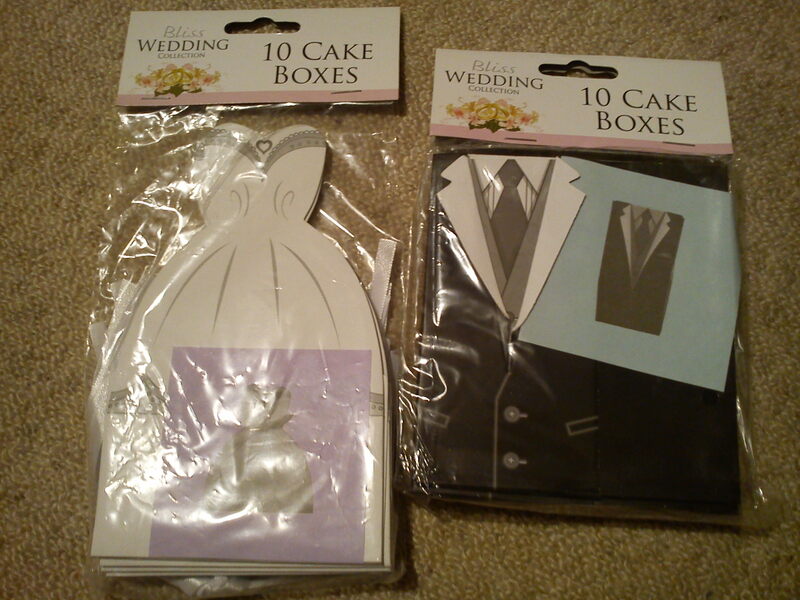 Poundland offers a small range of wedding paraphernalia, such as banners, invites and cake/favour boxes and confetti. In Poundland one day I spotted some Favour boxes that seemed nice so picked them up. £1 for ten – BARGAIN! So, just think, everywhere is worth a look, as you never know what you are going to find. The above boxes will need minimal assembly to take them from flat packed into the box form they will take. We will be putting the dress boxes on the table for the women, and the suit boxes for the men. Pounland no longer stock these, however they do currently stock favour boxes with a simpler design that could be pimped with ribbon to fit your theme.